Article Objective: Ocular rosacea can be a distressing condition because the chronic ocular inflammation, irritation, hyper-reactivity, blurred vision and severe dryness can interfere with work, daily activities, social activities and relationships. Many of the prescription and over-the-counter treatments for this disorder fall short of expectations because they only focus on one or two underlying disturbances. Our new Rosadyn+ formula is unique in that it was developed to target all five causes of ocular rosacea: (1) Lacrimal Gland Inflammation, (2) Eyelid Inflammation, (3) Goblet Cell Damage, (4) Fragile Ocular Surface Blood Vessels and (5) Uncontrolled Overgrowth of Ocular Surface Blood Vessels. By normalizing all three layers of the tear film that protects and soothes the eyes, blocking and removing pro-inflammatory substances on the eye surface, and repairing broken blood vessels and blocking uncontrolled blood vessel growth, Rosadyn+ is the most comprehensive ocular rosacea treatment on the market. 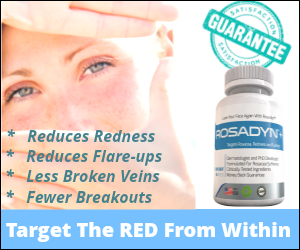 The specially-selected, pharmaceutical-grade nutraceuticals incorporated in the new Rosadyn+ formula have been shown in scientific and clinical studies to have potent anti-inflammatory and healing actions on inflamed ocular surfaces, eyelids, blood vessels, tear film layers and the two very important glands that are central to ocular rosacea pathophysiology –Lacrimal glands (which produce tears) and Meibomian glands in the eyelids (which produce oil). This article will also show the selectivity of ingredients for the eye area due to their unique ability to track down and bind to inflammatory substances on the ocular surface and eyelids. According to a large National Rosacea Survey taken last year more than half of the rosacea sufferers polled had active ocular rosacea symptoms. The physicians who performed the survey emphasized that this number is probably much higher because many rosacea sufferers do not know the tell-tale signs of ocular rosacea or incorrectly assume they just suffer from allergies, dry-eye syndrome or blurred vision. Without the correct treatment ocular rosacea usually worsens over time, making a proper diagnosis critical to treatment. Below is a list of the most common ocular rosacea symptoms. Feeling as if you always have sand in your eye or a “grittiness”. Our tear film is made up of three layers – an outer oil (lipid) layer, a middle water (aqueous) layer and a mucous layer that lays directly on the ocular surface. These three layers work together to help maintain the overall health of our eyes and vision… and ward off infection and inflammation. Each time we blink, a protective coating of tears is spread like a film over the surface of our eye. If any layer is inflamed or dysfunctional, ocular rosacea symptoms may develop or worsen. Oil (Lipid) Layer: The outer layer of our tear film is an oil or lipid-based layer. This layer is produced by Meibomian Glands on the edge of the upper and lower eye lids. Its main purpose is to seal the tear film which helps reduce evaporation of our natural tears. Water (Aqueous) Layer: The middle layer is mostly comprised of water. This layer is produced by Lacrimal Glands adjacent to the eye. 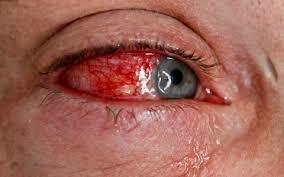 Its job is to lubricate the eye, wash away particles and prevent infection. Mucous Layer: The inner layer is the mucous layer. This layer is produced by hundreds of tiny Goblet Cells on the surface of the eye. The mucous layer allows the watery layer to spread evenly over the surface of the eye and helps the eye remain moist and lubricated. It also provides the underlying cornea with nourishment. This layer helps the tears stick and anchor to the surface of the eye. 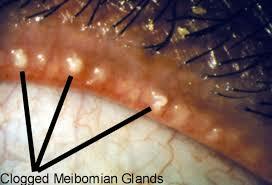 Meibomian glands are glands that are arranged vertically within the eyelid near the lashes. The force of an eyelid blink causes oil to be excreted onto the surface of the eye. The oil is the “staying power” of the tears that helps prevent rapid tear evaporation. There are approximately 50 glands on the upper eyelids and 25 glands on the lower eyelids. 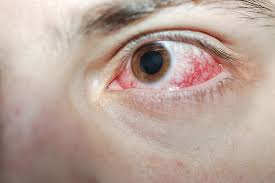 In a patient with Meibomian gland dysfunction (MGD) — which is very common in ocular rosacea — vision and eye health is affected because there is a lack of oil secretion or the oil is released with inflammatory molecules. MGD, also termed posterior blepharitis, is the most common form of lid margin disease. In the early stages, patients are often asymptomatic, but if left unmanaged, MGD can cause or exacerbate dry eye symptoms, ocular irritation and eyelid inflammation. The oil glands become blocked with thickened secretions. 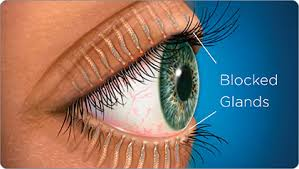 Chronically clogged glands eventually become unable to secrete oil which results in permanent changes in the tear film and dry eyes. Mediterranean Olive Fruit Extract — this superfruit contains several types of lipids that mimic meibomian oil. These lipids stimulate the production of healthy oil and increases the flow of oil onto the ocular surface which is one of the most beneficial actions of Rosadyn+ on ocular rosacea. OptiZinc — this special form of amino acid-chelated zinc activates dozens of anti-inflammatory proteins in the meibomian glands, the eyelids and on the eye surface. This has a profound affect on oil health and production. Sulforaphane (Enzyme-Activated, Enteric Coated) — this nutraceutical penetrates deep into the meibomian glands and helps to reduce inflammation, hardened sebum, and block the production of dangerous inflammatory molecules. Pomegranate Berry Superfruit — this nutraceutical scavenges inflammatory molecules on the surface of the eyes and helps protect and repair dysfunctional or damaged goblet cells. The mucous layer stabilizes all three tear film layer, thus it is critical that Goblet cells are healthy and functional. Maqui Berry Superfruit — works synergistically with our Pomegranate nutraceutical to create a healthy ocular surface and quell most forms of inflammation. OptiZinc — this nutraceutical activates several key repair enzymes and peptides on the eye surface that actively fix Goblet cells and increase healthy mucous production. Menaquinone-7 — this potent nutraceutical actively repairs the walls of fragile blood vessels and constricts these dysfunctional vessels. Menaquninone-7 also turns off a dysfunctional enzyme that allows too much calcium into the wall of blood vessels — greatly reducing future telangiectasias. Eastern White Pine Bark Extract — this nutraceutical activates multiple repair enzymes throughout each layer of damaged blood vessel walls and can effectively reverse dying blood vessels that are on the verge of breaking. This does such an exceptional job that eye drops have started incorporating the Eastern White Pine Bark extract to repair ocular surface blood vessels and treat blood shot eyes. Sulforaphane (Enzyme-Activated, Enteric Coated) — this nutraceutical is the most potent blocker of uncontrolled blood vessel growth on the market. It inhibits all four stages of angiogenesis. Sulforaphane can also trigger a cascade of enzymatic reactions that break down and remove newly developed blood vessels that are diseased or defective. Eastern White Pine Bark Extract — this nutraceutical not only repairs damaged blood vessels, but it is one of the most potent blockers of angiogenesis. Angiogenesis is one of the core causes of rosacea symptoms and triggers in the eyes and on the face, so suppression of this vascular disorder is key to clearance. Our new Rosadyn+ formula is unique in that it was developed to target all five causes of ocular rosacea: (1) Lacrimal Gland Inflammation, (2) Eyelid Inflammation, (3) Goblet Cell Damage, (4) Fragile Ocular Surface Blood Vessels and (5) Uncontrolled Overgrowth of Ocular Surface Blood Vessels. By normalizing all three layers of the tear film that protects and soothes the eyes, blocking and removing pro-inflammatory substances on the eye surface, and repairing broken blood vessels and blocking uncontrolled blood vessel growth, Rosadyn+ is the most comprehensive ocular rosacea treatment on the market. * We do strongly recommend if you currently are undergoing medical treatments for any medical conditions that you seek approval from your medical professional first before taking any supplements, changing lifestyle or dietary changes that may affect your condition or treatments.